I write this post at the risk of alienating the readership. It seems like most women enjoy crafts. I do not. Doing crafts with my children is a labor of love, simply put. You might think I’m jaded, but I think it’s a lot of work to plan for crafts and it can be a lot of money to buy supplies for crafts. And for what? So you can clutter your house up for a week and then try to sneak the crafts off to the trash can when your kids aren’t looking? Yes, yes, I know. Crafts help teach children to be creative. It’s good for kids to do tactile things and develop their fine motor skills. Crafts can also help to cement the ideas represented in a unit study. And most compelling of all, children (usually) really enjoy crafts. So, I need to get over it and show love to my children by doing crafts with them. Right? Never mind the fact that I do a lot of other things like reading books and baking and taking my children on countless fun outings. If I do not do crafts with them, I’m a failure. Right? My husband keeps reminding me that, instead of thinking of crafts as a waste of time, I should think of it as an investment of my time. I should do it for love. So, just because I have a kindergartner again this year, and I really, really love said kindergartner, I put a smile on my face and ordered Memoria Press’ Book of Crafts. When it came in the mail, I showed it to her and even tried to act excited about it. One of the reasons I have been stressed out by crafts, in the past, is the fact that I generally have scrambled at the last minute to get craft supplies. The Book of Crafts has a handy-dandy list at the very front detailing all of the supplies you will need to complete all of the crafts in the entire book. So, the fact that I could go shopping once, and get everything for a whole year, was compelling. 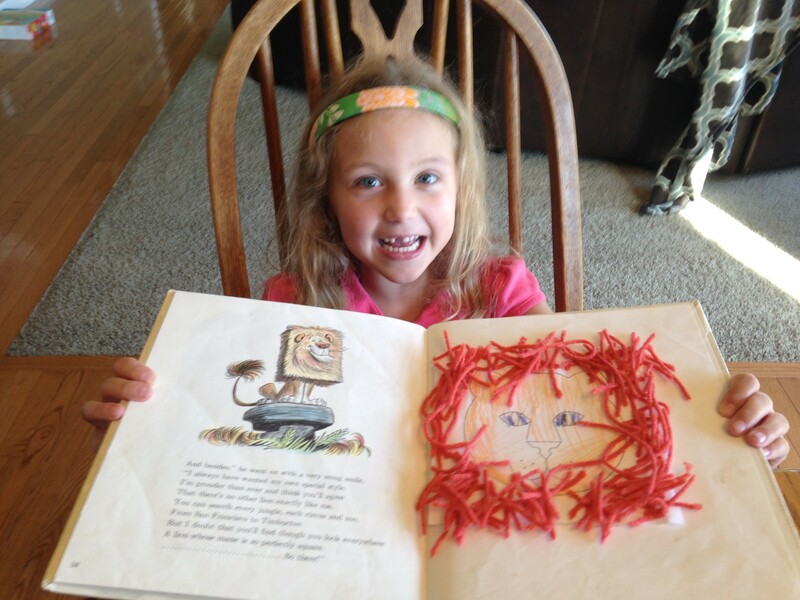 A proud kindergartner and her craft creation. 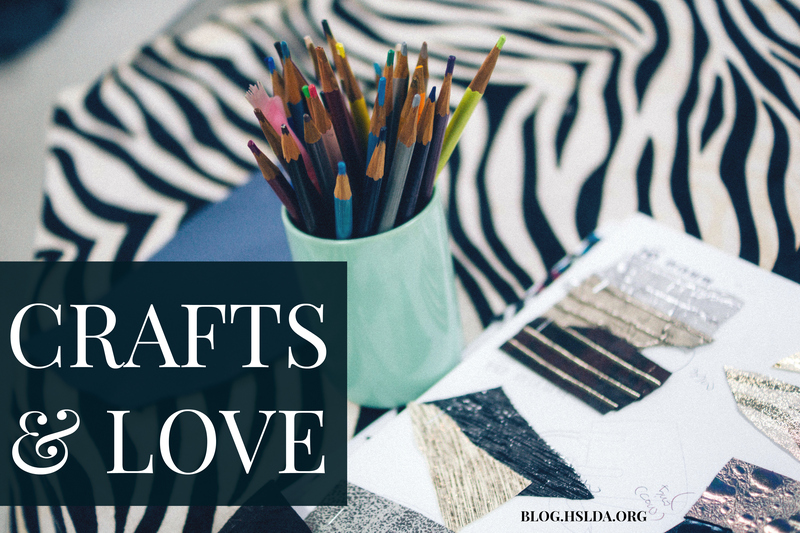 The crafts in the Book of Crafts are also fairly simple—even people like me should be able to do them—and each craft corresponds with a quality book of literature, recommended for the kindergarten age group. The literature and crafts in the book also correspond loosely with several of the seasons and holidays throughout the year, which is nice. I am very pleased to say that three whole weeks have passed by, and I have done crafts with my kindergartner and preschooler each of those weeks. Score! Just today we read Hubert’s Hair-Raising Adventure by Bill Peet, and a few other non-fiction picture books about lions and other African animals and safaris. My two-year-old son pointed to the picture of a zebra being eaten by a pride of lions and said, “He’s having a bad day.” Yes. Understatement. After reading these books, we did the corresponding lion-mane craft, involving cardstock, scissors, glue, crayons, and orange yarn cut into bits. It took a little bit of time to plan and execute this craft, and it made a mess, of course, but the smile on my kindergartner’s face was priceless. My two-year-old also proudly made a blue-colored lion, and his smile was pretty cute too. I have thought a lot about how love often means investing ourselves in what other people appreciate, even when it’s not our personal cup-of-tea (or slathering-of-glue, as the case may be). Sometimes we need to get out of our comfort zones and meet our loved ones where they are at. I love my kids. Therefore, I do crafts. Photo Credit: First image graphic design by Charity Klicka, second image by Amy Koons. That was great. My mom got it right, and I did the same with my girls. Whatever you made went into your room (so everyone knew it was yours!). That way, when you ran out of room, it was up to you what had to come down to make room. Smart woman, my mother. Donna, your mom sounds like a genius! Why didn’t I think of that? Thanks for the kind comment. She really was a genius when it came to little kids. She was less fond of the bigger ones, but we all got through it. Hope you have a great Halloween!